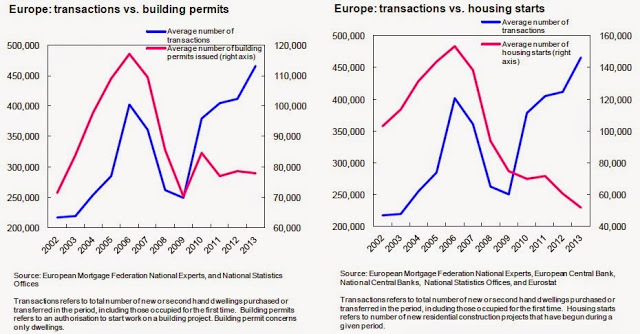 The performance of the European housing market remains mixed. 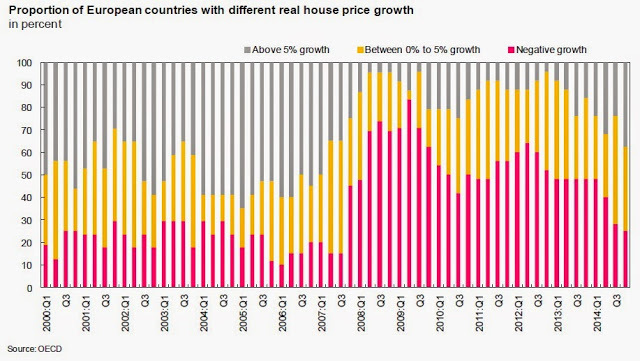 In Europe, house prices are rising in some countries and falling in others. Moreover, even though the number of transactions is recovering, housing supply indicators remain in the doldrums. There is also an issue of housing affordability. The bullet points below gives a summary of these developments. House price developments. Europe was the weakest-performing world region in 2014, with house prices rising on average by 1.6 percent, says Knight Frank. Similarly, Global Property Guide notes that “Europe’s property markets are surging ahead [(…) However,] some parts of Europe continue to struggle. Seven of the 22 European housing markets included in our global survey saw house price falls in 2014.” This mixed performance in the housing market reflects the divergent economic performance in Europe, according to Scotiabank. However, the momentum in house prices could be shifting. The graph below shows that the proportion of European countries with negative real house price growth has been on a downward trend since the last three quarters of 2014. Affordability. The issue of housing affordability has been discussed in many countries. In Europe, there are more people without a home today than six years ago, and there are not enough affordable homes available in most European countries to meet the increasing demand; these are two emerging issues from a new report that looks at the state of the housing market in the Europe (Housing Europe).